Charcoal was the source of heat for iron furnaces before the mass production of coal in the 1800s. It was made in the oak, hazel and alder woods of Argyll, Inverness-shire and elsewhere. Certain species of trees can be cut in such a way as to encourage new growth from the base of the trunk, which is a technique known as coppicing. So round oak or hazel wood could be cut once every 7 to 10 years, to make charcoal. The cut poles had to be stacked in a specific way, on a roughly circular platform before they were carefully burnt. The flat 'stands' on which the wood piles were stacked are usually found in groups, each platform being levelled and revetted with stones around the down-slope side if the hillside was particularly steep. Old charcoal burning platforms are to be found within ancient woodlands as well as on what is now rough grazing. 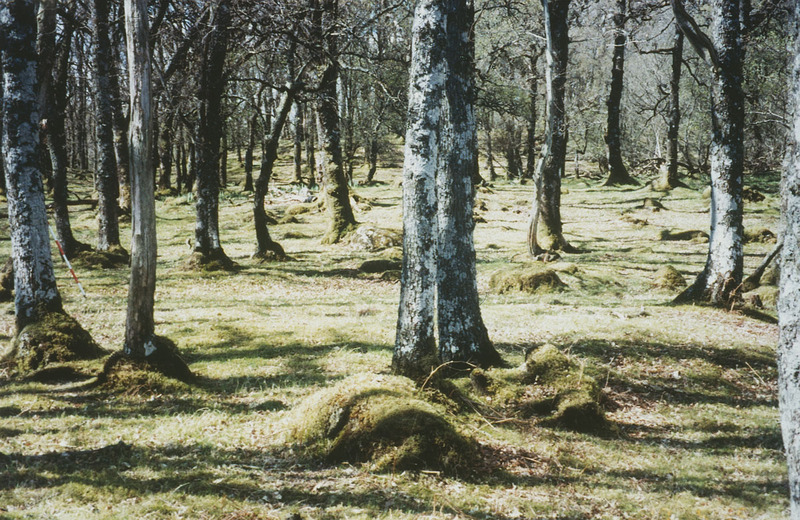 There are 26 charcoal burning platforms like this one in the oak woods at Fernoch, by Loch Awe in Argyll, but they are rarely visible from the air and only occasionally noted on current OS maps. Most of those recorded as HLA data are in areas that have been archaeologically surveyed.